I mentioned back in September that we are now Parragon Book Buddies. This means that Little Miss H is sent a book every month to review. Recently, Little Miss H and I have been filled with colds and viruses. 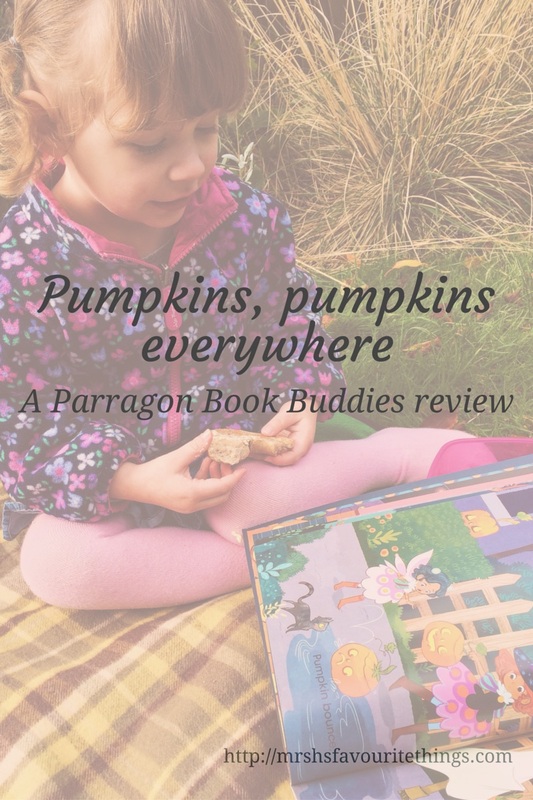 So sadly I did not manage to get the review for Pumpkins, Pumpkins Everywhere by Smriti Prasadam-Halls and Lorena Alvarez up in time for Halloween. Which is a pity as this book would have been perfect for the spookiest day of the year. This is a great book and has become one of Little Miss H’s favourites. She often asks for it at bedtime and I have no doubt that we will be reading it to her throughout the year. With this is mind, I decided to plough on with the review anyway. 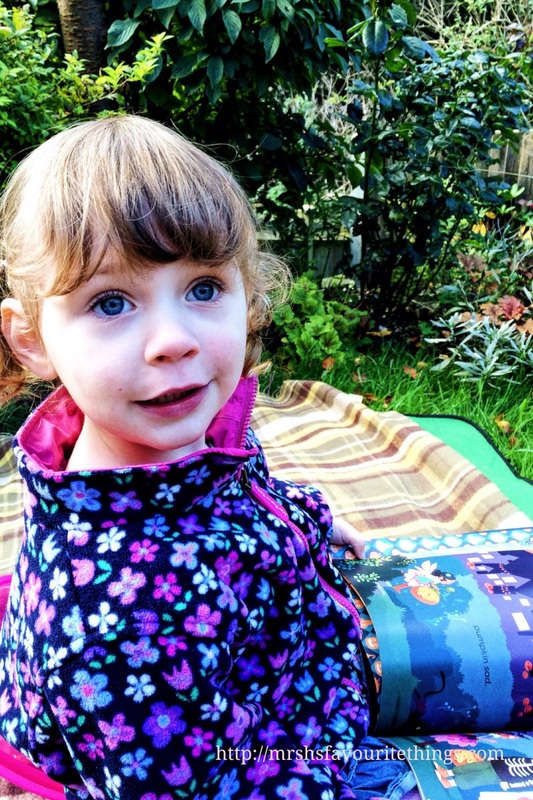 One autumnal morning a few weeks ago, Little Miss H and I wrapped up warm, filled with a bag with yummy bagels, drinks, rugs and her new book and went to have a picnic in the garden. 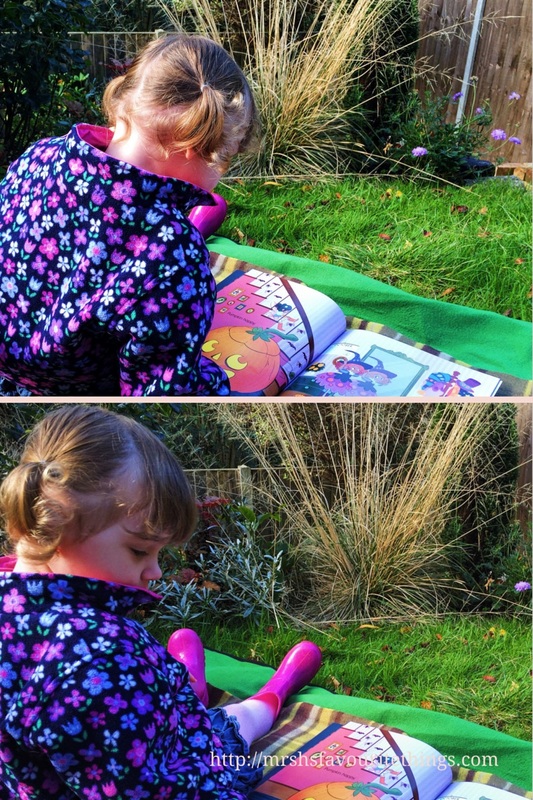 We had a fabulous time and Little Miss H fell in love with this fun and colourful book. It is filled with bright and beautiful illustrations. The front cover even has glitter on it and glitter is always a hit with Little Miss H.
The short paper book tells the story of four children going trick-or-treating and joining in a pumpkin parade. 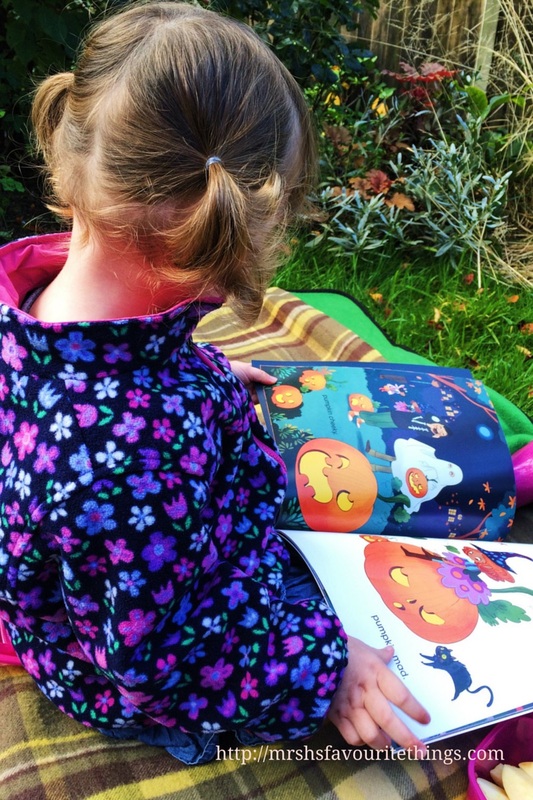 The book is simple for Little Miss H to understand and is an engaging and non-scary way to introduce the concept of Halloween. Little Miss loved looking at the different facial expressions on the pumpkins and pointing out the pumpkin bat, cat, wolf and spider. She frequently recites from the book. 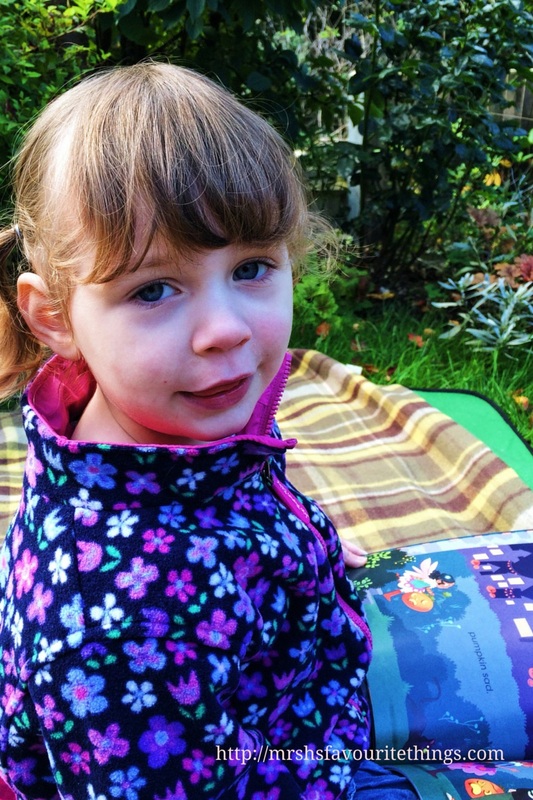 Pumpkins, pumpkins everywhere has been a brilliant tool to help Little Miss H understand emotions. She can now identify a sad, happy and confused face. She also loves counting the number of Jack o’Lanterns on a page and spotting all the different animals and children in costumes. 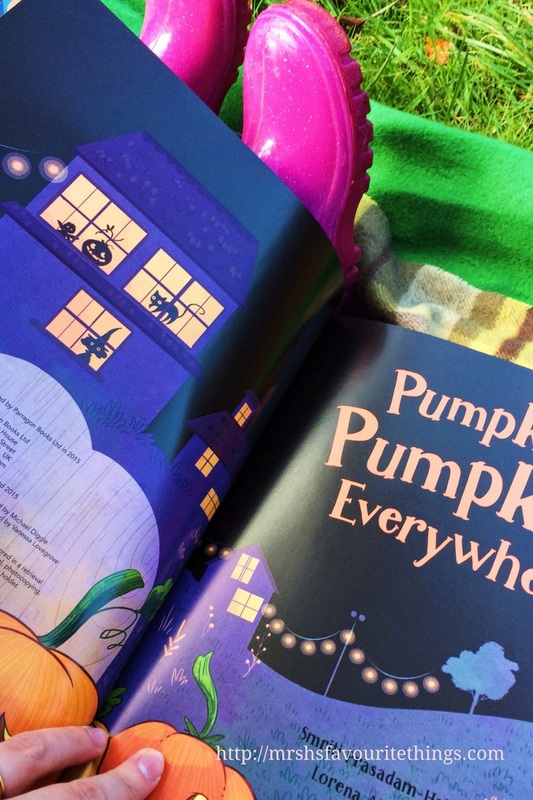 This is a lovely book and it made me so happy over Halloween to hear Little Miss H chanting “pumpkins, pumpkins everywhere” every time we passed a Jack o’lantern. 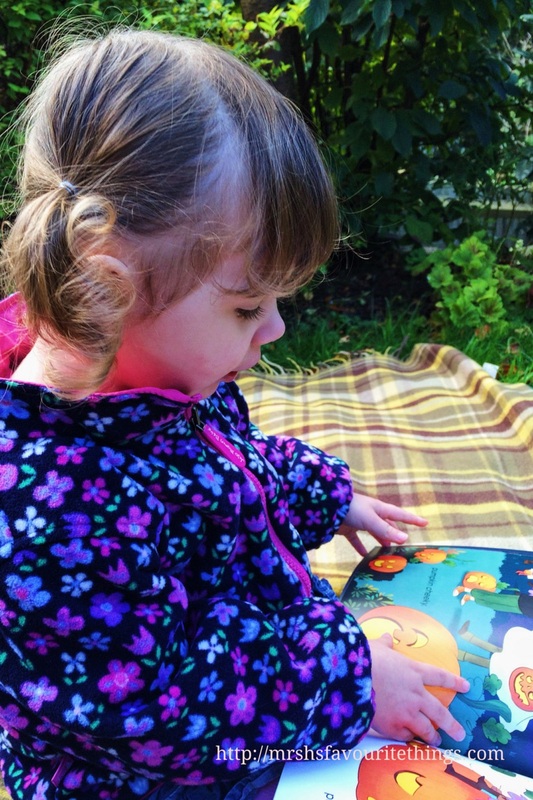 And the few hours we spent in the garden eating bagels and reading this book were some of the most precious moments I have shared with Little Miss H.
I was sent this book as part of the Parragon Book Buddies Programme but all thoughts and opinions are entirely my own. Sounds lovely. I like the idea of the picnic in the garden, too. Tyger was very excited to have a little packed lunch style dinner in the garden for bonfire night but it’s not something I can do often because Baby Bear would keep running off (and this is not the sort of garden he can be left to roam in, unfortunately). Would love a new book. We have HAD to read Peppa Pig at the Funfair every night for the last 3 weeks. He won’t let us read anything else to him. I can recite it in my sleep!! Love the pictures in the book. As you say, quite clearly captures emotions. I love the books that teach the emotions and facial expressions. My Elsie has a book like this with baby faces and you can tell she understand emotions and faces better as a result. 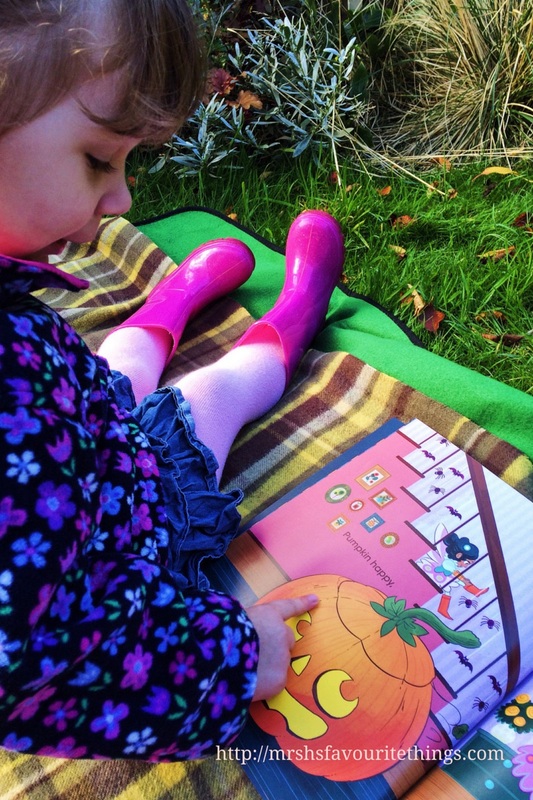 I love the fact that you made a little picnic outside, it’s a good way to engage your child with reading and it will help them not just associate reading with bedtime. It sounds like a lovely book – one certainly suitable for the season.